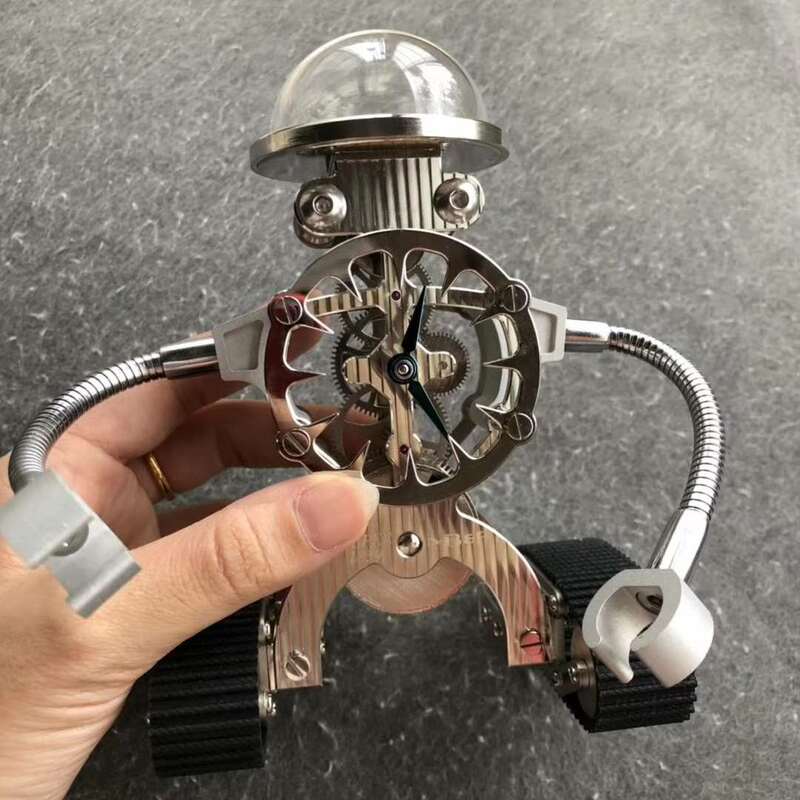 Today, I want to show you something different and special, it is not a watch, it is a robot. 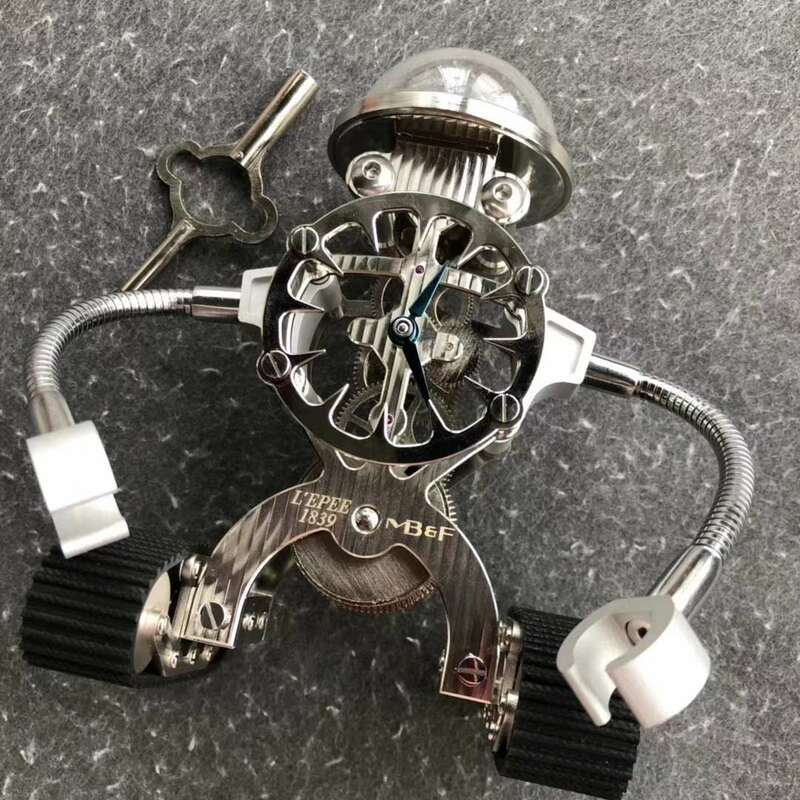 The genuine MB & F Sherman Happy Robot Limited Edition Clock was released at SIHH 2016, this one shown here is an imitation from Z factory, the whole robot clock looks like a movement, actually it is a custom L’Epee tourbillon movement that is 17 jeweled. Once being wound by the key, the clock will have 8-day power reserve. 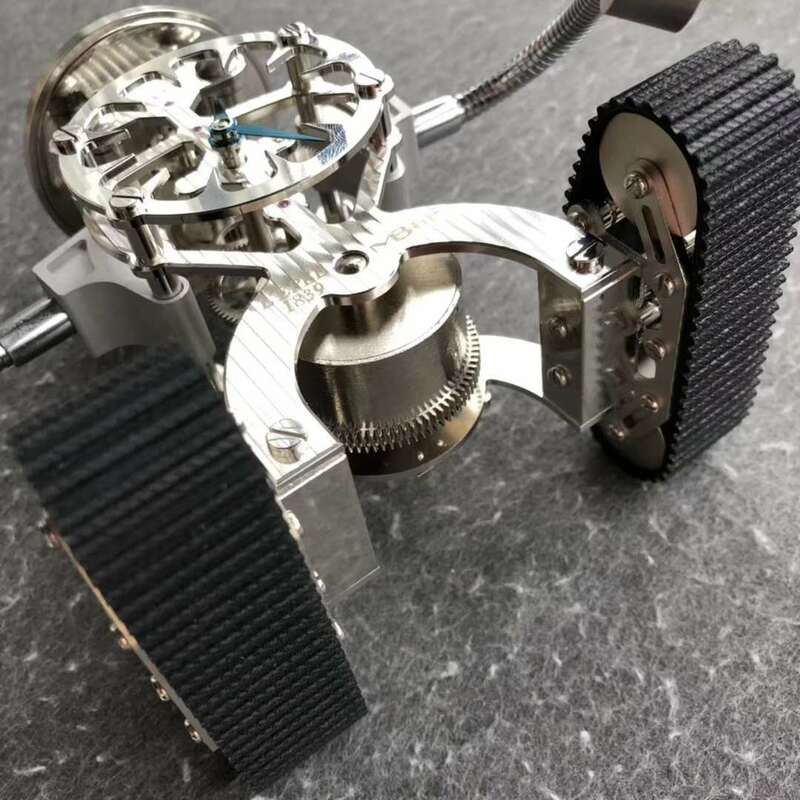 The size of the robot clock is 143mm in height, it is 109mm width and 80mm thick. 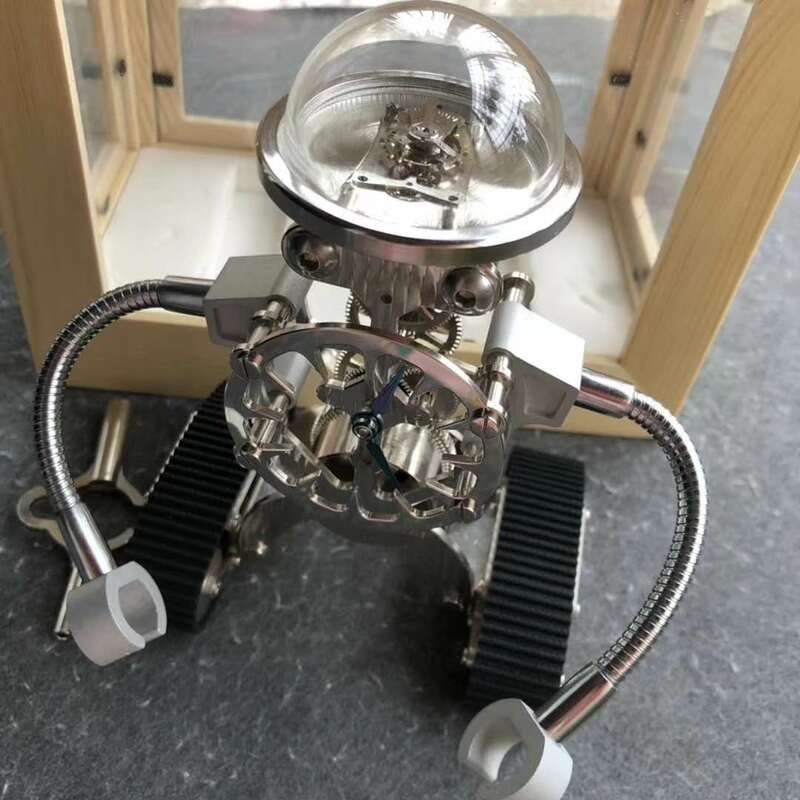 There will be a large wooden box to load the Happy Robot. The weight of this clock is 1kg. 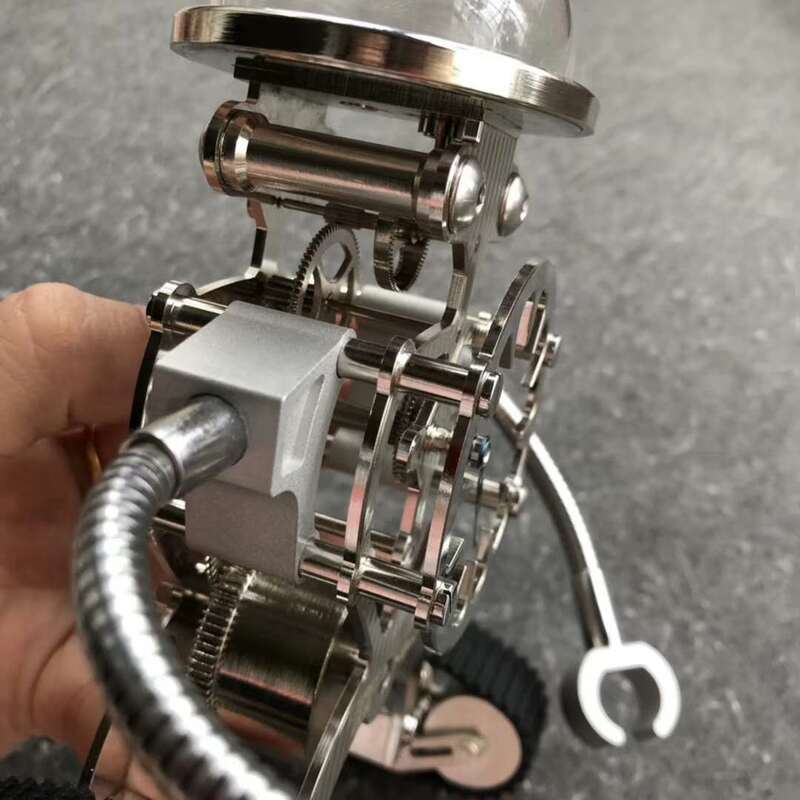 You all know some famous factories like Noob, ZF, BP, J12 and KW, but not familiar with this new TK factory, which was just established in the end of 2017. TK is specilized in manufacturing high quality Bell & Ross replica watches and some vintage PAMs. Bell & Ross watches were sold very well three years ago in our market, however, with the development of more popular Rolex Submariner and Panerai, few people are willing to buy replica Bell Ross watches, but this does not mean there no good quality replicas of Bell Ross. 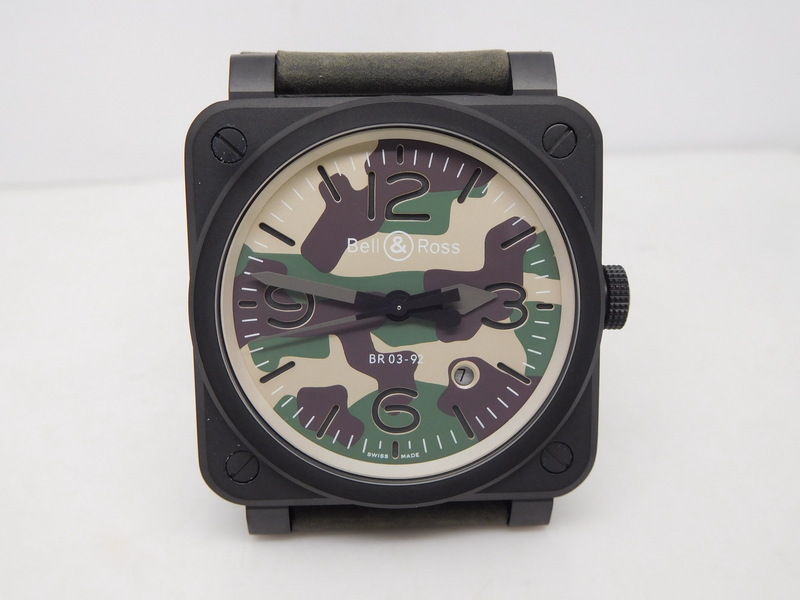 Today, I am going to give a review on a special Bell Ross BR03-92 replica watch, which uses the most in military element – Camouflage. 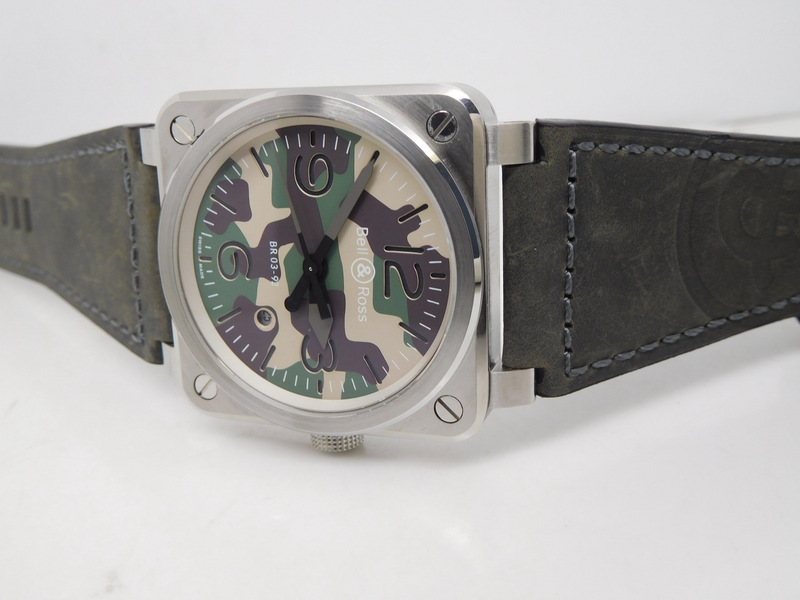 Here we call it Green Camo watch. 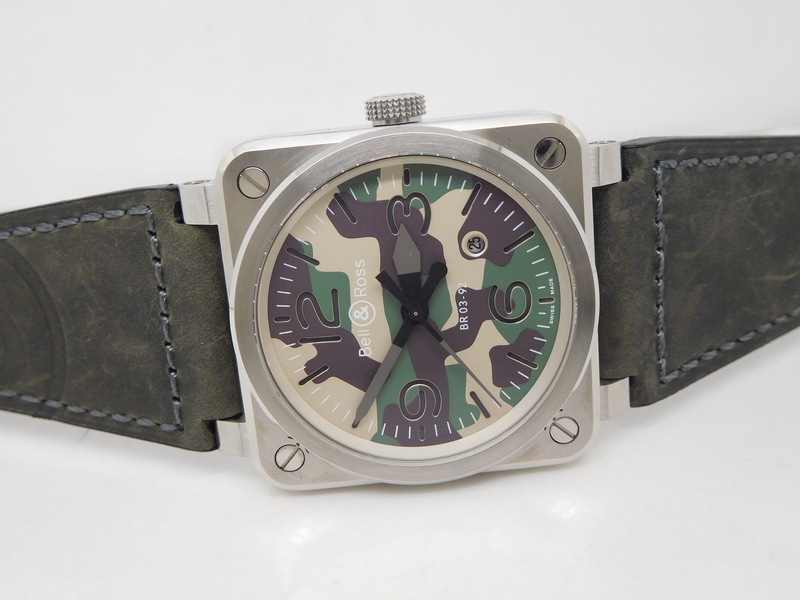 TK factory published two models of this Green Camo watch, one in stainless steel, the other is in black pvd. 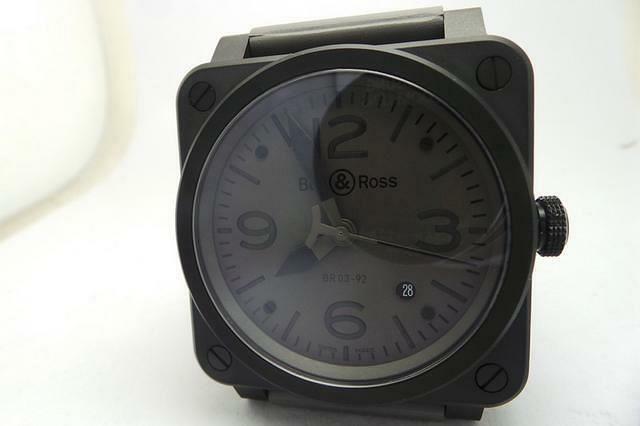 The replica Bell Ross BR03-92 Camo watch gets two bright points. Let us see the dial first, it is in silver gray. The camouflage pattern uses green and black color, Bell & Ross Logo and BR03-92 printings are in white. The dial uses Sandwiched structure, which is Panerai patented. There are four big Arabic digits of 3-6-9-12. Look at the date, it is set in a small round window at 4:30 on the dial. Second, TK factory uses a genuine Japanese automatic movement on this replica, it is Miyota 9015. 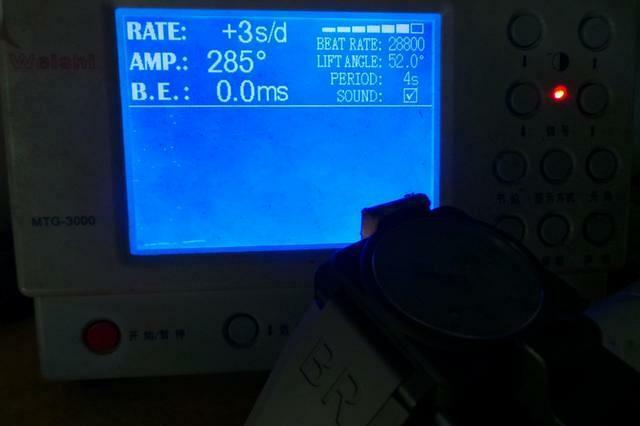 This movement is now widely used by replica watches because it has a much lower repairing rate than other automatic movements. Square case is made of solid 316L stainless steel, on frontal face of the case, it is well brushed, while the edge and corner of case are polished smoothly. Four screws are fixing through the case from front to back. Crown has unique groove design that is non-slip and very convenient to be adjusted. Case back is full of engravings, where you can read about the brand, reference and water resistant information. Because case size is 42mm*42mm, the leather band is wide and it is in distressed look. I love this style, the old-look leather band perfectly matches the military camouflage theme of the replica. 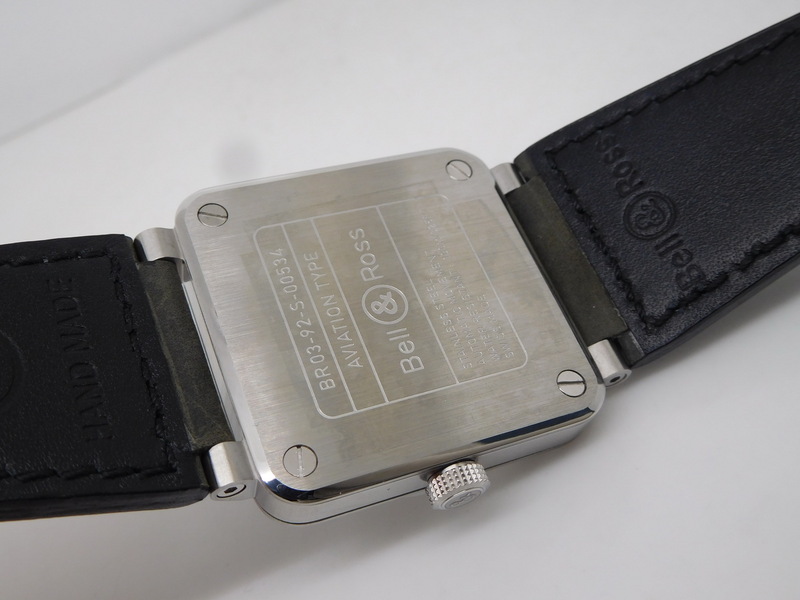 Besides, the band features gray hand stitching and Bell Ross logo. 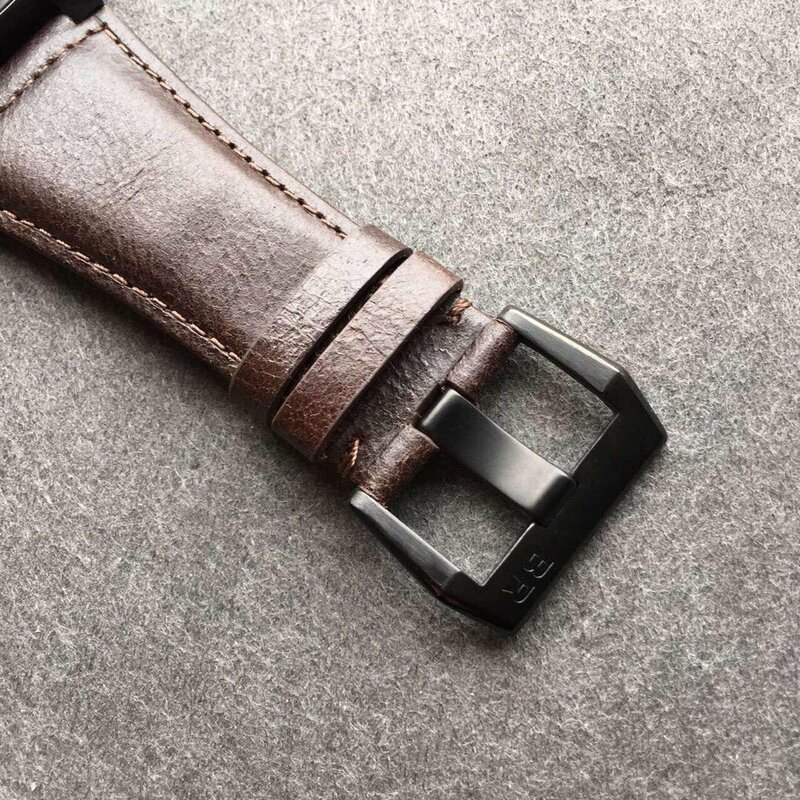 A brushed steel tang buckle is fitted on the strap, like case, the buckle has each side to be cut and polished perfectly. 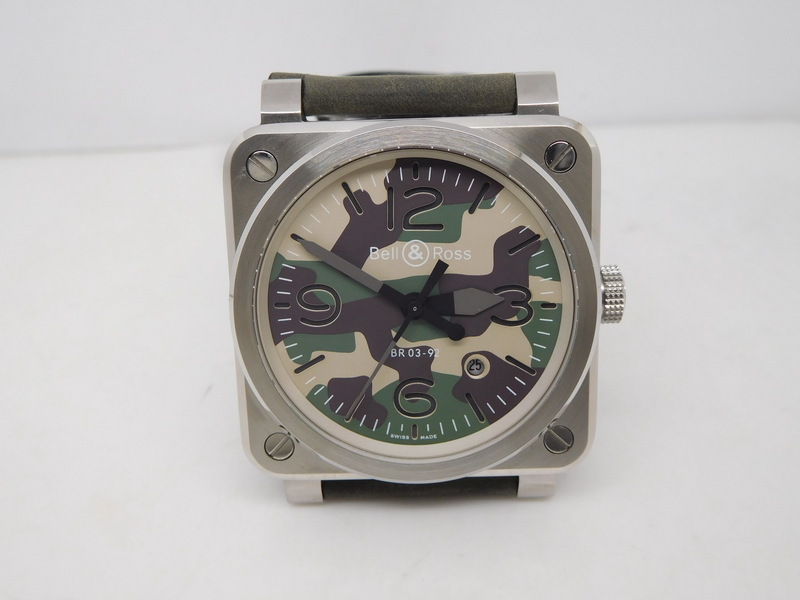 Well, if you are finding a military watch to fit your camouflage suits, this Bell Ross Camo watch will be a good choice. Have you ever think about how could a watch’s design be? All you can imagine is those traditional and classic designs? 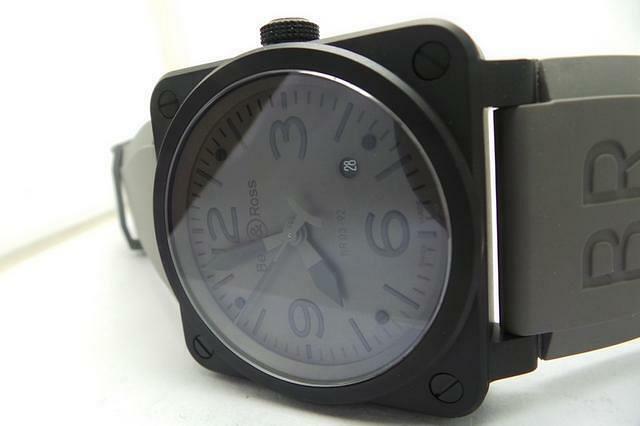 There is a watch brands launches many military watches in bold designs, that is Bell & Ross. This Swiss made watch brand’s design inspiration comes from aircraft dashboard, the unique style and accurate function make it become famous and hot in the watch market. 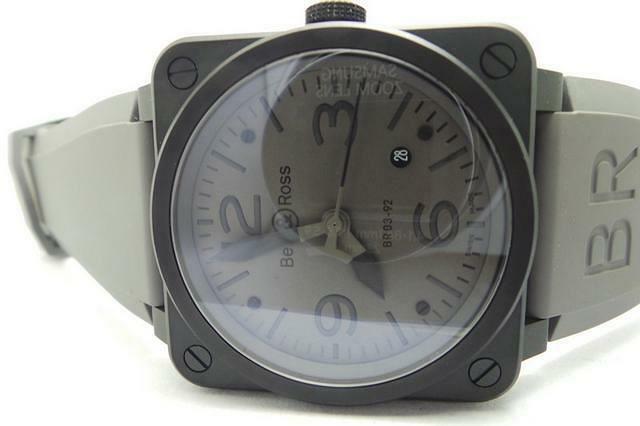 Bell & Ross releases this Aviation BR 01-92 Airborne watch with a kind of scary skull-like dial. 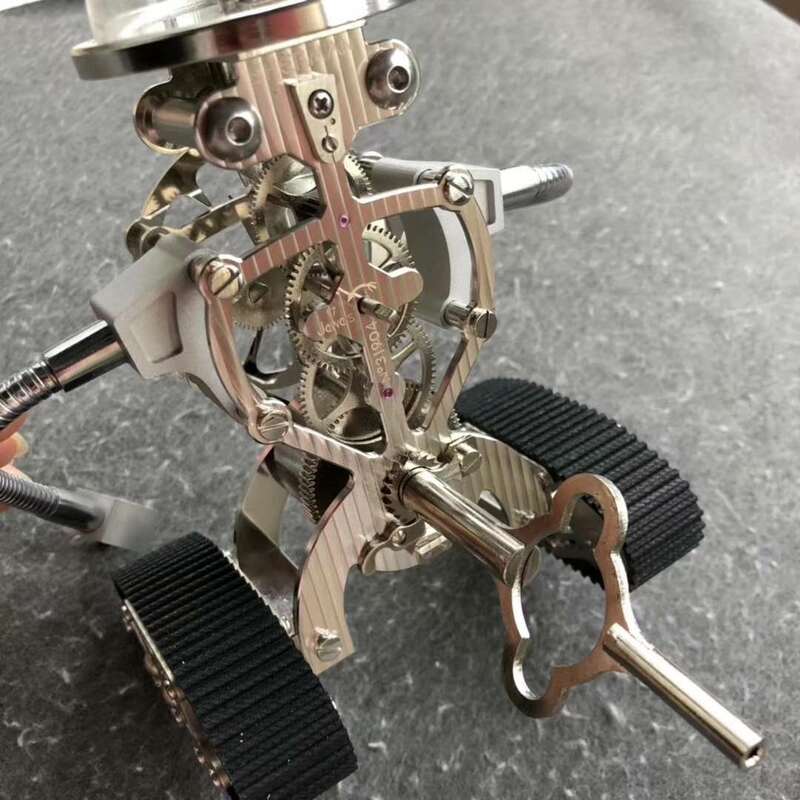 Unexpectedly, this model becomes a surprise for the watch fans. 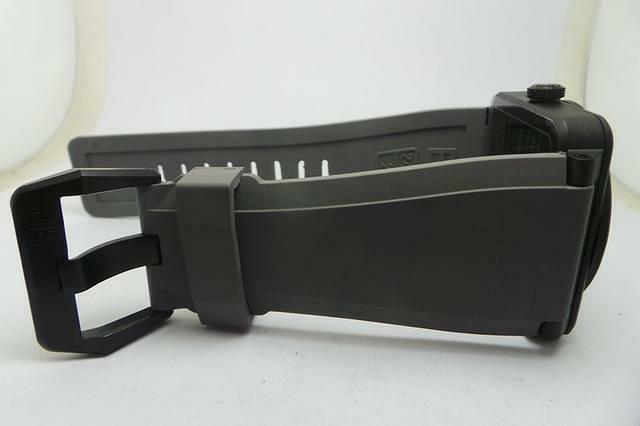 And now, I found this high quality replica BR01-92 Airborne watch for you. Let’s have a look at it. What is your feeling at the first sight of the watch? Special? Crazy? Or scary? We should admire the designer of this watch who brings us such an amazing watch. 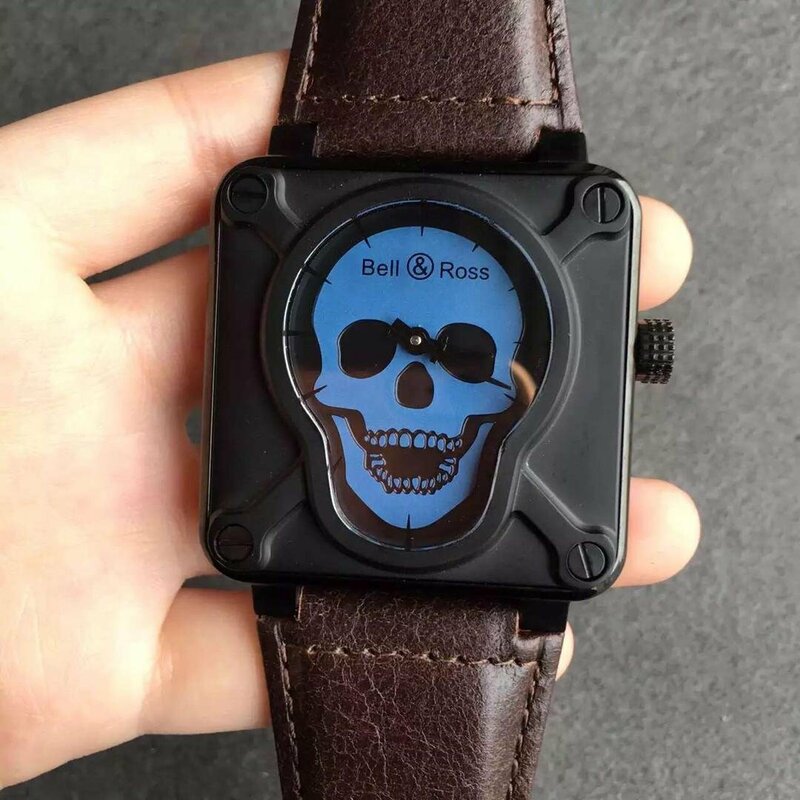 This replica Bell & Ross watch case is made of stainless steel with DLC black painting, and the blue skull dial is very showy in the case. And the square sharp also makes it more military style. 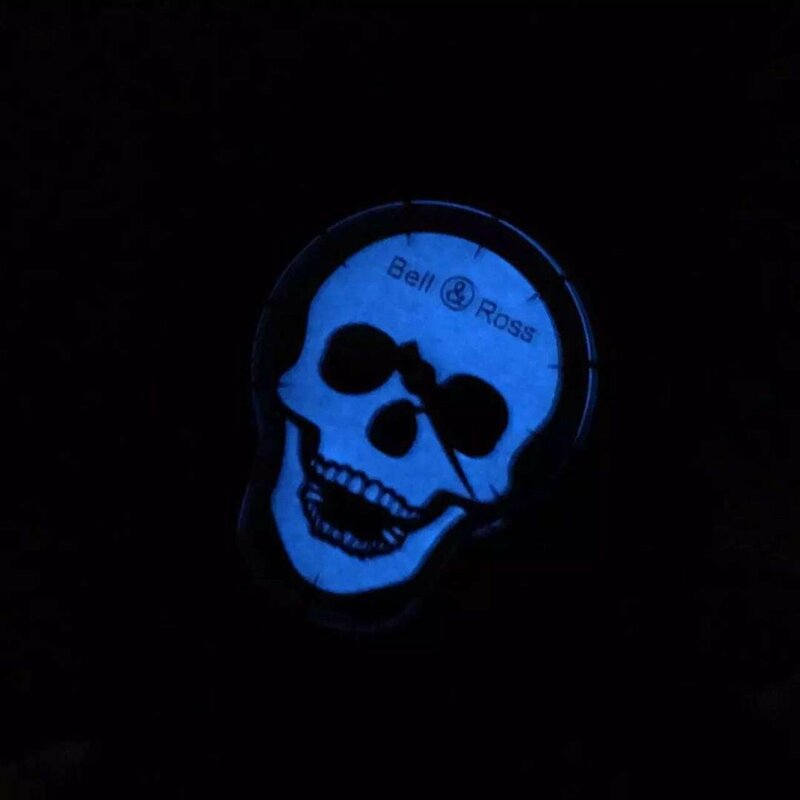 The vivid blue skull dial is superlume, and it looks beautiful in the dark. 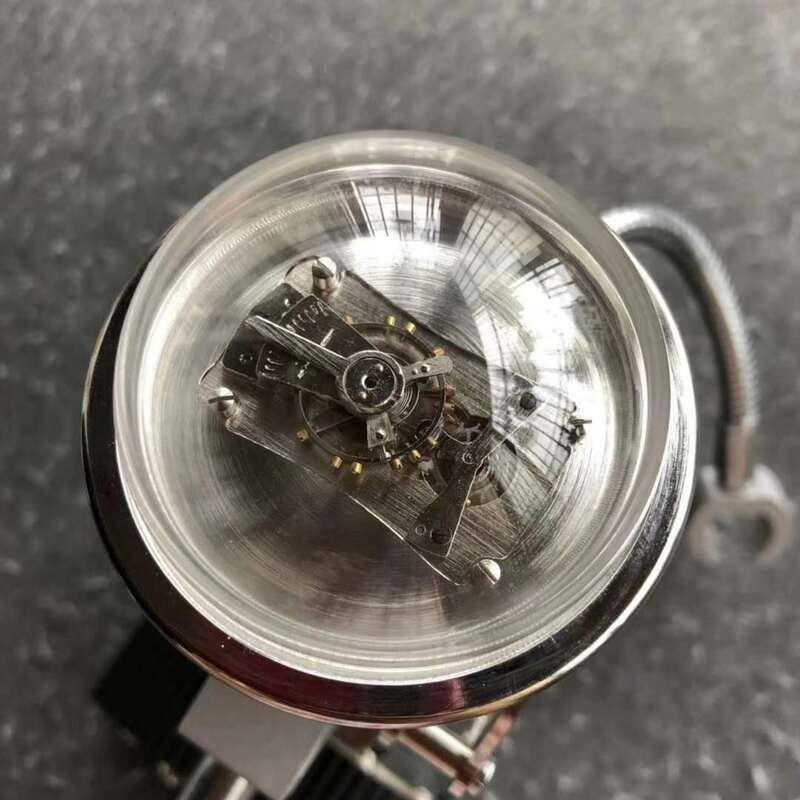 The movement it is equipped with is a 9015 one, supporting the accurate timing function well. On the crown, there is the symbolized logo “&”, which is as exquisite as the genuine. Watch bracelet is made of genuine cow leather in brown color, making the black case and blue dial nicely. The front cover is made of sapphire crystal, transparent and anti-scratch. 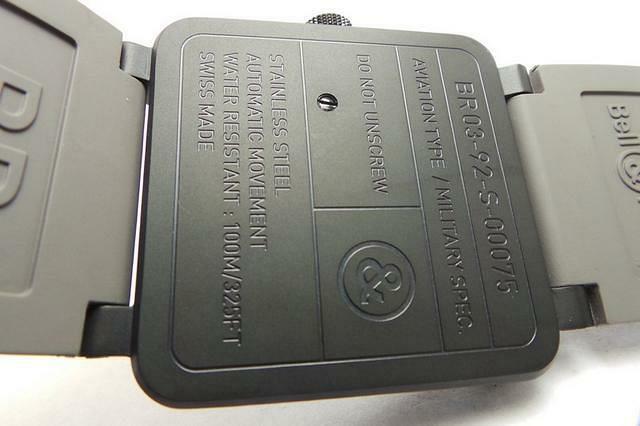 On the case back, we can see serial number on it, everything is exactly like per original watch. Replica Bell & Ross Aviation Airborne watch is very hot item among people who would love to try something new, especially for those young who love extreme sports. After all, it is such a cool watch. 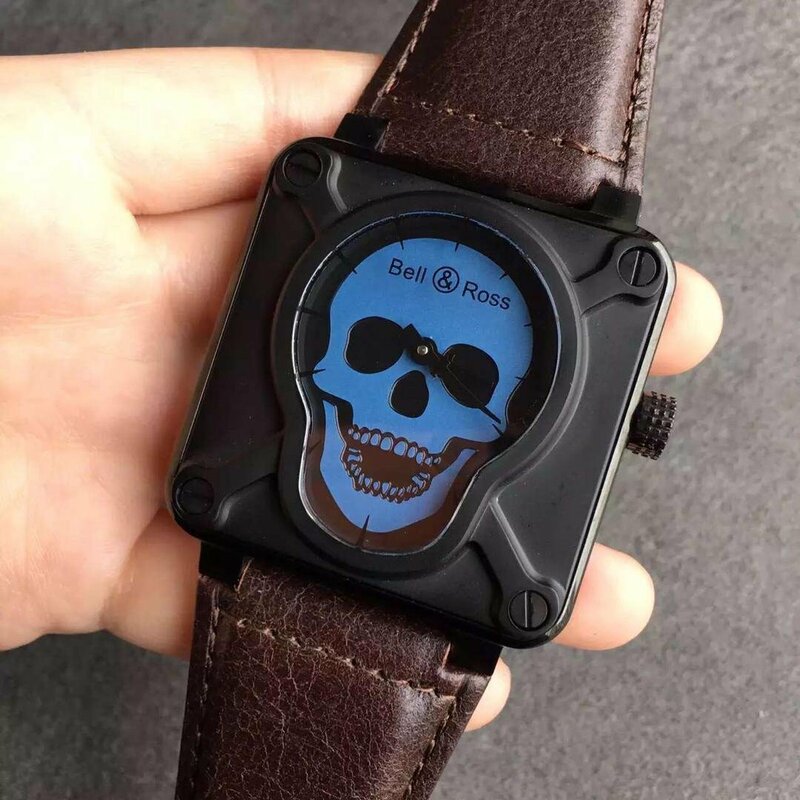 Of course, there are also professionals would like this model, as they already have bought so many different normal watches, they love to try something different, and they can wear it as a sport watch, a very different sport watch. Do you admire the commandos who with strong body and nimble mind in lots of movies. 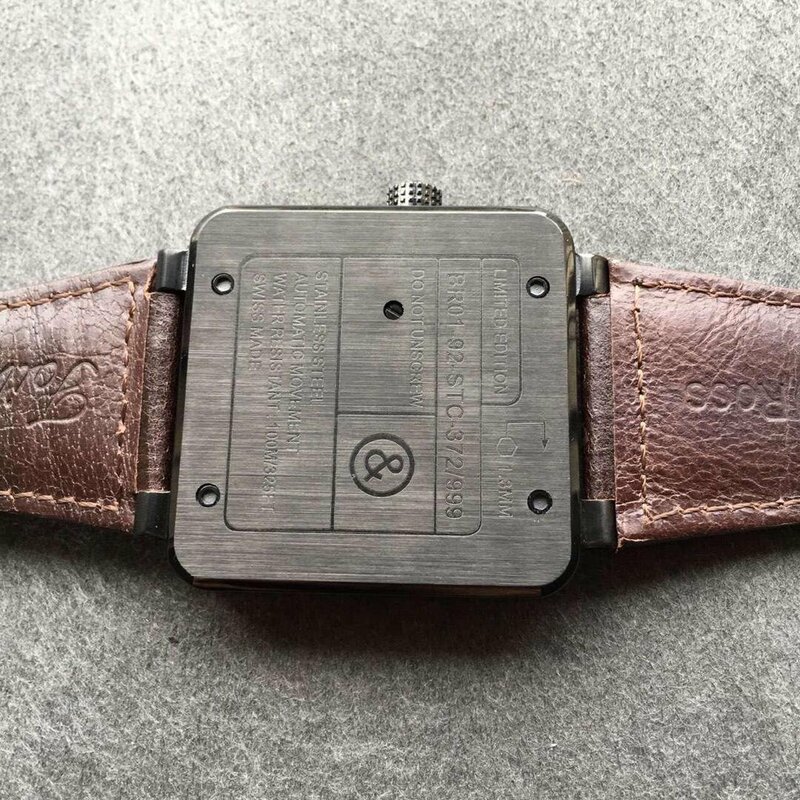 Today I am so please to recommend an excellent replica, which based on the genuine of Bell & Ross BR03-92, it was a kind of wrist watch that created for commando exclusively. This replica with tempting appearance because its unique color and plating made it with special low-key temperament. I believe that you may fall in love with this replica which is full of masculine taste. Firstly, Round dial was used in formal watch normally. However, this replica with unique shape to catch our eyes. It with square dial which reflects the retro style. 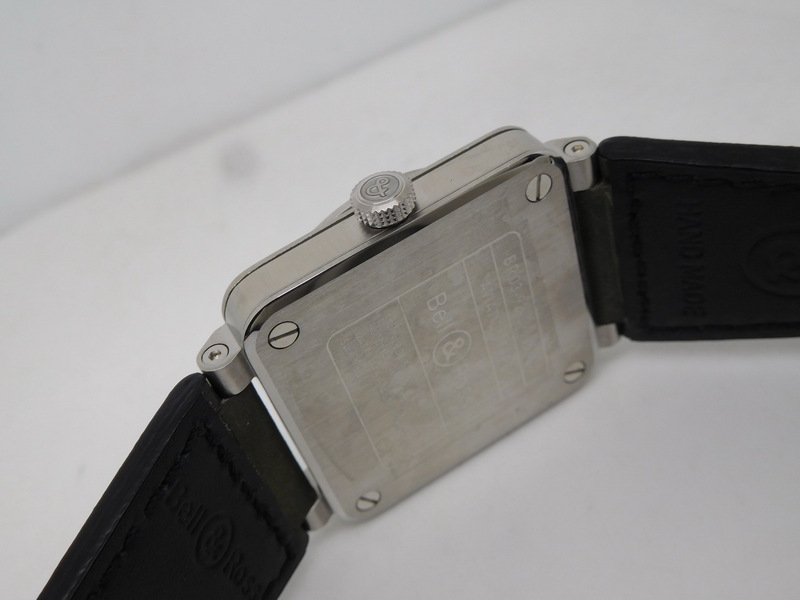 The wide square case with the size of 42mm,has high identification. it has four classic lock screws on its four corners. This special design added industrial design feeling to this replica Bell Ross. Its simple crown has inherited its simple military style of Bell Ross. When we observe it carefully, we can see it has printed “&”this logo on the top of crown, which has revealed its identity of this brand. The thickness of this replica was middle size, 11.5mm. Its case was made of solid 316F stainless steel with PVD coating. Its glossiness was so exquisite, it so nice in quality even though with low-key style. The simple lugs design also reflect masculine temperament. Secondly, this replica created its unique and low-key visual effect through its low-key matching color and matt plating so that it can reveal the secret of commando. For instance, its dial used military green, along with four big gray Arabic numbers, surrounding with stick markers and scales. From this matching color, it was really low-key in main tone. But this design made it more generous. A date display window at 4:30 position. Its clear sapphire crystal has been coated with AR. Beside, after the process of coating super luminous, it can display without mistakes no matter in day or at night. Through its solid case back, we still felt its beauty deeply due to its perfect engraved pattern. 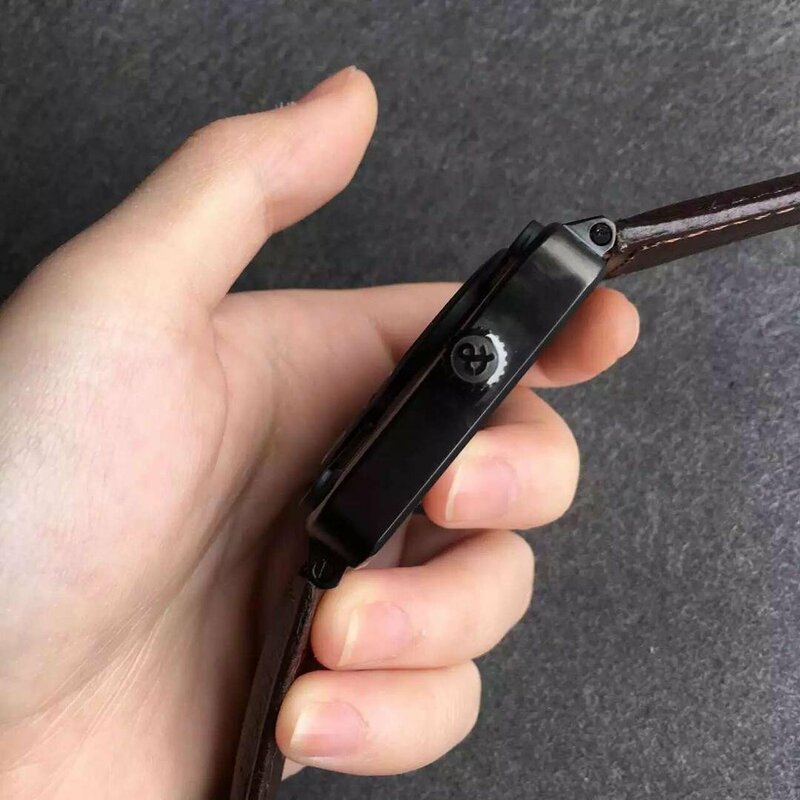 As one kind of casual wrist watch, this replica matched with a rubber strap, it would be more convenient for our sport since it was really lighter than other straps with anther material. This replica with a goal of satisfying the needs for everyone through providing clearer in reading. 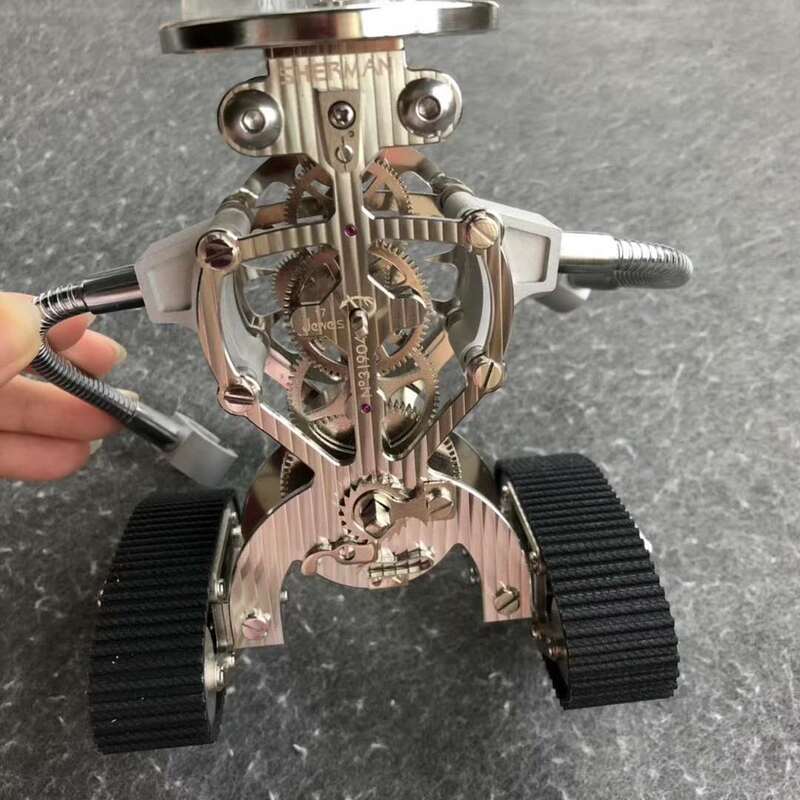 Therefore, that should has deep connection with its movement. It equipped with Japanese Miyota 9015 Automatic Movement, which with the function of shock resistance. This powerful movement has proved that it may be outstanding in travel time. In a word, this replica was simple and low-key in style, but it with reliable and accurate capability, reveals its elegant temperament any time. You want to be as masculine as commando, I think this replica may be your good choice.